We are always amazed at the profound impact a single individual can have on the lives of the companion animals who pass through our shelter. 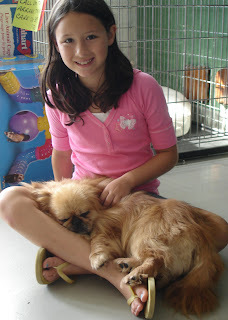 Here is one young volunteer who made a world of difference to Hercules, a senior dog picked up as a stray. Hercules has some pretty significant disabilities. But he had no idea that life was not perfect while he was lying in the lap of this dedicated young volunteer. Clover's Owner Saw Her in the Paper! $2,500 grant to spay/neuter feral cats received! Casey the Basset Hound Adopted!